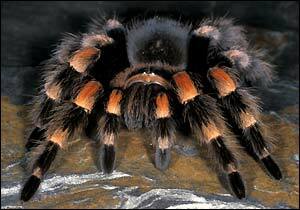 Today I want to write about a scary looking spider, the Mexican redknee tarantula. These large spiders can grow to around 20 cm long. Despite looking very scary, they are actually easy to handle which, when combined with their unique markings, makes them the most popular tarantula species to be used in movies. Mexican redknee tarantulas don’t weave webs to catch insects, but wait in their burrows for the opportunity to ambush their prey, using their powerful legs to hold down their meal while they bite them with their large venomous fangs. They eat insects, small frogs, small lizards and mice. Their hairy legs are used to detect vibrations, smell and taste. When threatened, they also have the ability to kick hairs off their stomach and back legs, causing severe irritation to the eyes and skin. These guys live in forests along the central Pacific coast in Mexico. They are considered Near Threatened due to poaching for the pet trade. I hope that you found these facts interesting and learned something new. Are there any other interesting facts that you would like to share about Mexican redknee tarantula?